16-year-old Frost understands why she's spent her entire life in an abandoned apartment building. The ruined streets below are hunting grounds for rogue robots and Eaters. 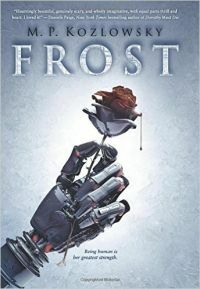 With only a robot as a companion, Frost must face terrors of all sorts, from outrunning the vicious Eaters. . .to talking to the first boy she's ever set eyes on. But can a girl who's only seen the world through books and dusty windows survive on her own? 16-year-old Frost lives in a horrible world. All of her life she has lived in a few rooms in a run down building. Outside is a dangerous world of rooming Eaters, killer robots, and gangs of cruel humans looking to enslave anyone they find. Frost has been living with pet, Romes, and a robot, Bunt, who sometimes has the mind of her father. Romes gets sick and Frost believes that the one way t save him is to leave the safety of the only home she has ever know and take Romes to a rumored place of safety near the city. She faces impossible odds and only her faith in a better world keeps her going against all the dangers that she is about to face. I very much enjoyed this book as a great story about faith and love in a world that has lost both. I think a wide audience of teens and adults will also like this book and not just those that enjoy dystopian science fiction. I give it five out of five stars and I recommend that you read it.